just thought i would post up a foto i took while between casts.. this my lovely scar just before the tech removed the stitches.. hmm it’s gonna be a beauty! stitched up like a sunday roast. Nice scar, Feedme! At least you got it in the course of heroic endeavour! Sure it will look loads better now the stitches have gone. What did they use? Knitting Wool? I wonder why surgeons do not take some embroidery classes before being allowed to practice on patients… Sunday roast, right. 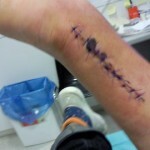 Wow what a great scar that is going to be - makes me think of the scene in Jaws when they compare war wounds. A great story to go with badge of honour as well. minimilitiaa on if the drugs dont work, youre taking the wrong drugs. feedme has completed the grueling 26.2 ATR miles to full recovery!